Before entering the financial service industry, George spent eight years in the National Football League; in operations for the Cleveland Browns and Pittsburgh Steelers. 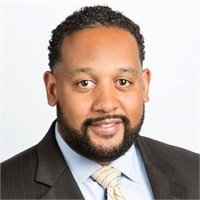 In addition to obtaining a Bachelor’s of Science degree from Hampton University, he also holds a Masters of Business Administration from Liberty University. Having gained a wealth of experience as a financial advisor with Wells Fargo Advisors and Flinthill Financial, LLC, the opportunity to offer the highest level of fiduciary standards and a premier client experience presented itself with Rutledge Financial Partners, LLC. He takes pride in working for a firm that puts you first. George strives to help each one of his clients plan for a financial future in a way that pursues his or her goals. In addition to helping his clients, he is very active in his community. George is currently involved with The Nature Conservancy, The Mecklenburg Audubon Society, and Iraq & Afghanistan Veterans of America. He and his family currently resides in Charlotte and he enjoys playing golf, attending sporting events, and learning about different cultures while traveling to various countries.